It's All About Balance: It doesn't get better than Kristin Chenoweth! Thanks to Oscar Mayer's Good Mood Mission (who invited me to blog about this event), I had the distinct pleasure of interviewing Kristin Chenoweth, the original Glinda in Wicked, Emmy winner for Pushing Daisies last season, and featured this season in Glee and as a guest judge on American Idol. Oscar Mayer kicked off its Good Mood Mission last week at the Grove, and the celebration featured not only Chenoweth, but the USC marching band, Oscar Mayer's Hotdoggers, and Flash Mob America. In this time where hope in Haiti is sorely needed, it's easy to forget that there are too many Americans who go to bed hungry every night. As I've previously mentioned, the LA Times recently reported an increase in homeless children here in the LAUSD district. Across California, the number of residents receiving food stamps rose by 25% (as stated in that same article). The Good Mood Mission is a perfect opportunity to give back in your community without spending a dime. Simply visit their website, and finish the sentence "It doesn't get better than __________" and Oscar Mayer will donate one pound of food to Feeding America. If you update your status, and become a fan of the Mission on Facebook, you'll donate even more! Oscar Mayer kicked off the event by donating one million pounds of food already. It just takes a few minutes to help meet their goal of one million more pounds by September. 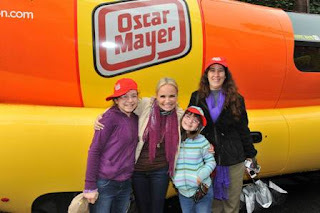 After speaking with Chenoweth, the girls and I rode around Hollywood in a Wienermobile! The girls tried to spread good moods on this rainy day, by telling people through the speakers, "Have a bunderful day in Hot Dog Hollywood!" It was pretty fun to see people's looks of astonishment, excitement, and befuddlement at this massive hot dog on Sunset Boulevard!! We took a break from the roads long enough to get Starbucks; my thanks to the Mission for buying my coffee and the girls' pastries. It was a crazy, dare I say, amayonaising day (oh, yes, I did!). Can't really say I'd ever imagined riding in a Wienermobile or interviewing Kristin Chenoweth. And to think it all happened in the same day? I still can't believe it. And for such a worthy cause? So cool that you and the girls got to do this... too fun! And all for such a wonderful cause. What a fun opportunity for you and the girls! I'm sure they will remember it for a long time to come. It dooesn't get any better than... building great memeories with your kids! That sounds like a wonderful day April! I can't imagine how much fun you had, and for a wonderful cause as well to boot!